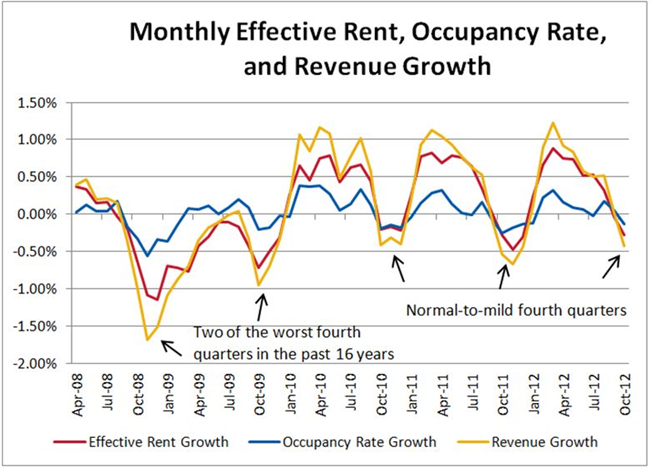 Axiometrics’ monthly apartment building investment report has a great chart showing the seasonal effects on effective rent, occupancy rate and revenue growth. How do you model seasonality in your budgets? What do you think is the best way to do this? Good presentation on the current national apartment building investment sector from Marcus & Millichap. New supply remains constricted except for a few cities, they didn’t mention any names *cough Seattle cough* but if you’re in one of them and tracking the pipeline it’s easy to read between the lines. San Francisco is rocking in class A and B, and in class C it’s….. San Francisco! Interestingly A and C properties there are showing rent growth of almost twenty percent while class B is just under ten percent. 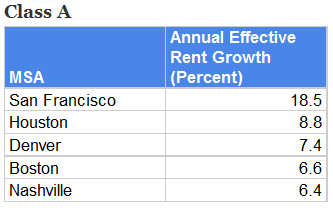 Any thoughts on why A and C are double the class B rent growth in SF? Note that 9.3% in class B still leads the US- Continue reading Top 5 Apartmentment Building Investment Markets for Rent Growth, by Asset Class. Posted on August 9, 2012 August 9, 2012 Categories Apartment Building Investment Cycle, Multifamily InvestmentsTags Apartment Building Investing, apartment building investment cycle, asset class, Boston, Class A, Class B, Class C, Denver, employment, Houston, Miami, Nashville, New York City, NYC, Raleigh NC, rent growth, rents, San FranciscoLeave a comment on Top 5 Apartmentment Building Investment Markets for Rent Growth, by Asset Class. How to Structure Apartment Building Investment Partnerships by Brian Ward of TCG Capital. Align the style and needs of the capital source with the operator. A long term operator shouldn’t be matched up with private equity that needs short term holds to clear their return hurdles. Equity capital today generally comes in two two types: preferred equity or joint venture (See the table linked in the article for a good breakout of when to use each). Blind pools are very difficult to get funded today —even the best and most sophisticated operators have had trouble executing this type of equity raise. There must be local knowledge on the management team, both lenders and investors want their operators close by. Operators must have Continue reading How to Structure Apartment Building Investment Partnerships by Brian Ward of TCG Capital. Posted on July 11, 2012 July 18, 2012 Categories Apartment Building Investment Cycle, Apartment Finance, Multifamily InvestmentsTags Apartment Building Investing, apartment investments, Blind pool, capital source, Class A, Class B, Class C, Deal Structure, equity raise, funding, Institutional Investors, Joint Venture, local knowledge, multi family investments, off market properties, Partnerships, Preferred Equity, Private Equity, skin in the game, trends, underwritingLeave a comment on How to Structure Apartment Building Investment Partnerships by Brian Ward of TCG Capital. Portland Apartment Market to add 31,000 jobs this year, vacancy to fall below 3%. As the next building cycle for the Portland area is still another year out, vacancy rates are expected to fall to historic lows across the metro. The overall vacancy rate will match the lowest on record at 2.7 percent, while the area’s lower-tier vacancy will fall to as low as 2 percent. 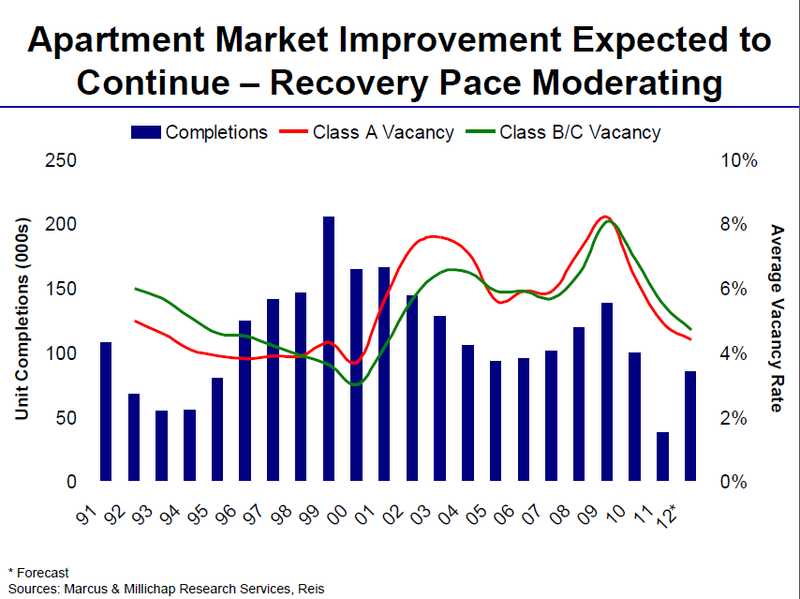 Marcus & Millichap notes that a lack of multifamily construction and the expansion of jobs in the region will be the prime factors behind the extraordinarily high rates of occupancy. Job growth is expected to rise 3.1 percent—from 20,500 positions created in 2011 to 31,000 positions created in 2012. Of particular significance will be the development of a new Intel facility, which is expected to create thousands of construction jobs and spur large demand for Class B and C apartments. Cap rates for trophy buildings are likely to average in the high 4-percent range, with Class A and B assets in Continue reading Portland Apartment Market to add 31,000 jobs this year, vacancy to fall below 3%. Posted on May 7, 2012 May 7, 2012 Categories Multifamily Investments, The Economy and Current AffairsTags Apartment Building Investing, apartment building investment cycle, apartment demand, apartment vacancy, Class A, Class B, Class C, ecomomic outlook, employment, job growth, occupancy, PDX, Portland, supply, trendsLeave a comment on Portland Apartment Market to add 31,000 jobs this year, vacancy to fall below 3%.